Ok, money management tips and financial advice are just my opinions as is all other information on this site, so consult with experts in the perspective field of any area I speak about before taking my advise, especially with money. Cause I've been broke plenty of times, lol! That said, I've learned lesson which I will share in hopes you will avoid becoming broke or use to become wealthy! Now. Since the disclaimers are over with, lets continue with money management tips and advice. . . If the information here helps you or you think it can help others like it and remember..... Sharing is Caring. Plus sharing helps us to keep providing free content. A trucker's life offers amazing opportunities to start creating wealth. The sooner you start saving, investing and budgeting, the younger you'll will be when you can kick back and relax in financial freedom enjoying all life has to offer you and giving back to others in need. You can ride the left lane in that RV like its Sunday evening everyday of the week if you want! You won't have to stress about social security (which may not be there for you in 20yrs), or your future health expenses if you began to plan and develop good financial habits now. You'll be able to enjoy life with family and friends, and help others in need. It is then that you live rather than exist. To reach this level you need to be disciplined, dedicated, motivated, and focused. It is a goal that is attainable by anyone with the ambition to bring it into fruition. Though I am not there, I am happy with progress. Living a truckers life gives you a great opportunity to create wealth especially if you are single and just out of school. 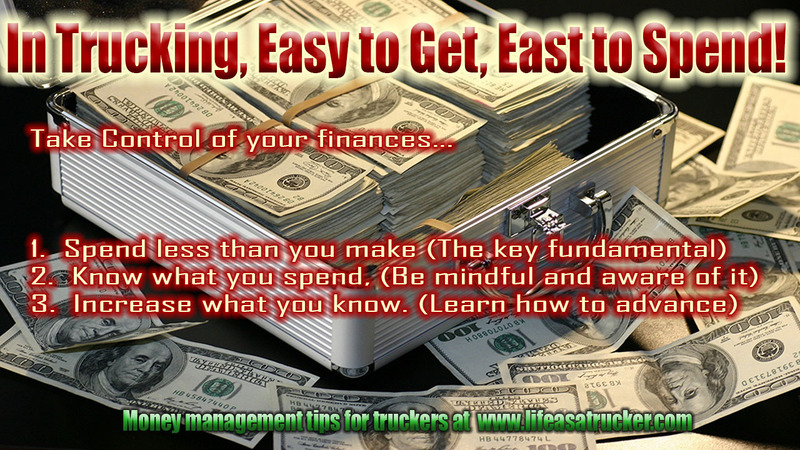 If you are already a truck driver and on the road relax, you can still use trucking to create wealth. Just continue to read this page and see where you are in your journey, you may or may not need to make some changes in direction or way of thinking. If you are just starting out trucking, why spend money on a house you will hardly stay in or a car you'll hardly drive? Save that rent money, electric bill money, and cable bill money. If you already have a crib eliminate the cable, satellite or other high priced services for the few days you will be home if it is your intentions to create wealth. That money will serve you better paying off your debts, creating/building credit, or saving for investments. You would make the perfect roommate for someone. They should charge you a small flat rate because of the fact that you will be gone most of the time and use minimum electric and water. If you have no one to work with you on this arrangement, a hotel room for a weekend out the month is cheaper than renting for a month and paying electric, water, and cable. Plus, you would only incur a charge if you actually need a room. If you want to stay out and make money you won't be paying for an empty house. Take a load with extra time to deliver if you need a break and get a room at or close to your delivery location. If that's not good enough for you, get a boarding room. Consider an account for investing in case getting a trucking becomes a desire later. Some of the same things apply. If you want to pay your dues now instead of later, you might want to consider cutting back on all unnecessary spending to save for family nest egg so that you can have a financial cushion or safety net. Make sure to discuss ways to cut down spending and agree on a budget for home and road expenses. Get on the same page. We do know that money is the most common cause for divorce. In my book I even talk about how wasteful it is to be elaborate on a wedding if you don't have a certain amount of money set aside. However, I realize that seems extreme to a lot of people. In any case, we all pay our dues. You either pay the bulk up front and make sacrifices or you pay them later and usually for a longer length of time. Some cultures spend beginning years staying with family just to have help with kids or save up a knot of money for starting the family with a cushion. When you become a truck driver get the things you will need before you go on the road. Make your list of items so that you will not forget something when you go shopping and pay way too much for it at the truck stops. Healthier eating habits plays a significant part of your big picture in many ways. If you do get caught out on the road needing more than 1 item, ask ahead on the CB if you are in unfamiliar areas about Wal-mart sightings. They are more popular than UFO's, I guarantee someone will have seen one nearby. There is always truck parking at Wal-marts at the end of the lot or at the truck delivery area. Truck stops aren't evil but they charge for convenience. (and they should) It's up to you to plan ahead so that you don't spend there unnecessarily. Prepare a budget so that you will know exactly what you are doing with your money. Don't let the thought of doing a budget scare you,it doesn't have to be anything fancy, just list your expenses and once you get few months pay use the lessor monthly amount or average them. information about banking online. You'll get 3 times more interest (if not more) on your money with an online bank. The Flying J Truckstop's has internet banking too. Note: You don't have to have that many, if you are good with your discipline in saving and budgeting then you can do just 2 accounts. Or just do it your way. I am just making a suggestion if you need a little help getting er done separating your money and keeping it from hitting your hot little hands is an effective technique. lol, worked for me. 1. One savings account for your Emergency fund. 3-6 months of your living expenses. I use a local community bank for this account. You could also use a credit union with low fees. 2. One saving account for retirement this will be your Roth IRA or whatever you and your financial adviser decides for your goals. If your employer offers a 401k max that out for your retirement account. I use a local community bank for main savings. Lower fees and relationship building. Could also use a credit union which may be better do your own comparison. 3. Open a checking account to pay your bills out of. I recommend this account to be with a large bank. I use Bank of America. The only reason, I say that is because of easy access all across the country. As a trucker this convenience has been a plus to me more times than I can count. I have pulled up on a Bank of America with access by truck in awkward places. You won't find that with many smaller banks. However, if you are perfect in planning and paying everything ahead far enough to avoid unexpected things it should help you eliminate the need for that type of access. (Obviously that is something I am still working on getting right! Hey, I am human. At least I know my weak areas! :-) Or you could use the Flying J's Institution too. 4. Open a checking account for money you will be saving to invest. As you read and learn more about your interests, money, business your will start to recognize opportunities to flip your money. For much greater return above anything you could do in a bank. This is how you will create wealth. You are waiting for a steal not a deal. Until then just keep putting money in this fund. DO NO SPEND IT ON ANYTHING MATERIAL THAT WILL LOSE VALUE. 5. The next checking account will be what you use after you put your money away in the other accounts. This is where the money comes from for going out to eat the movies, etc. If you can get automatic draft from work, having a set amount go straight into your accounts is a very useful tool. (As a trucker you might want the set percentage of your checks and not a specific dollar amount because every week is not the same amount unless you have a dedicated route.) It eliminates the temptation of spending when you cash your check cause it never reaches your hand. The only money that you should be spending is the money allocated for spending in your budget. Do not create another bill for yourself that you don't really need. I said need not want. You are serious aren't you. Discontinue all current expenses you have that are not necessary also. I would say 90 percent of us are wasting money monthly on some unnecessary expense. Sometimes it to keep up with the average household or even what's normal for most Americans. Well truth is most Americans are not actually focusing on creating wealth like you are, they just work to get a check to spend on what make them feel good immediately, so you can't behave like average Americans. Unless of course you want average results. Do you need cable? NO. Do you need all that over priced rental furniture? Not really, it's just nice to have. If you are single do you even need a house or apartment as a truck driver? No I said need not want. You are serious aren't you? That money could be going into investments to create wealth. Pay off your debts. Start with your smallest highest interest bills. Work your way up. As you get rid of your bills apply the money to the next bill your paying don't go and spend the extra money on stuff. You are setting the stage for building your credit up, this will be an important part of creating wealth. Well truth is most Americans are not actually focusing on creating wealth like you are so you can't behave like average Americans. Unless of course you want average results. Do you need cable? Do you need all that over priced rental furniture? If you are single do you even need the crib as a truck driver? That money could be going into savings for investments to create wealth. Pay off your debts. Start with your smallest amount or highest interest bills. Work your way down the list. As you get rid of your bills apply the money to the next bill you're paying don't go and spend the extra money on stuff. You are setting the stage for the next level in your journey to financial freedom. You want to get your credit in the best shape as possible. Your goal is to get a score of 700 or better. You can get free credit score reports at www.annualcreditreport.com. However, if you have never had debt you probably need to build your credit. If your credit score is lower than 700 (like mine was) you need to establish a credit history and build your credit. If you have never had credit apply for a few credit cards until you are approved for 2. Try to get cards that you can use for needed purchases like gas cards or a regular credit card from the bank to buy food. What you will do is use them for the purchases and pay the all of the most of the balance each month. You want to keep a small balance but focus on charging no more than 30% on any card. You don't to want max your cards if you want to build your credit. You also are not doing it to rack up credit card bills. It is nice to pay it all off because then you owe no one but I think your credit score increases better if you have a small balance to pay every month. Leave a $10 balance outstanding or something like that.. If you can't get approved for a regular credit card try one with your bank secured by your deposit in that bank. Start your LLC and build your business credit as well if you plan on doing business. As you are driving, saving, and building credit, you and the spouse (if applicable) should also be studying about money management, building credit, retirement and investing so that you are aware of what is out there that suits your goals and situation. This lingo seems sophisticated but its not once you do some reading. A great book to read is Tony Robbins - "Master the Money Game"
There are so many options for setting up long term accounts for retirements. Many trucking companies will match your contributions up to a certain amount by a certain amount. Maxing your contributions into retirement accounts will offset your taxable income. Once you are setting aside a lot of money for retirement, make sure it isn't just sitting idle in a savings account. That won't even keep up with inflation and you are missing opportunity to save on taxes. But save up in this account so that you will have that lump sum of money to make moves with. Like starting a trucking company or some other biz. For me this money has been for flipping cars, equipment, buying a truck, real estate, technology and my starting my own business. All for the purpose of generating a higher return than the bank would yield. For you the investment could be similar or something different but with the goal of generating income/revenue a return higher than traditional investments and in shorter time frame. Maybe you have a fund for several trucks and trailers and a maintenance account. You will have to determine how you want to invest. Just driving and earning the money will not create wealth for you it's what you do the with the money that counts. You could make a lot of money, yes. (Different ways to define 'lots of money') And over time, yes. I mean a mechanic can become a millionaire with discipline and enough time. 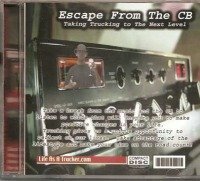 If you are a die hard trucker for life then you may be interested in starting your own trucking company. If that's the case you need to be soaking in all the information you can about making that happen. It's a risky business with little room for bad decisions because there is already too many things that could go wrong. (For instance, if you buy several trucks you need quality drivers that think the way you think.) You WILL NOT start a successful trucking company with bad drivers. That is probably the biggest headache of current established trucking companies, but they have plenty of money to fall back on. They can take those lost contracts and destroyed trucks for a little while. You won't have that cushion. So you have to be more careful and methodical about the type of drivers that you hire to grow a trucking company. Start here: How is your work ethic and job performance. You will need to have the right attitude toward your own job as a company driver to have the confidence in putting other drivers behind the wheel! lol. Many people don't consider that. I just watched a video the other day where the guy said, F it, it's not my truck. WRONG attitude. Law of attraction. With that attitude about your equipment or job, you will have that energy in your company (or anything that you do including how you treat other people) down the road. That does not equal to growth and prosperity. Non the less, if you are interested in creating wealth by trucking itself (maybe start your own Trucking Company) you need to make as many contacts as possible in the trucking industry. 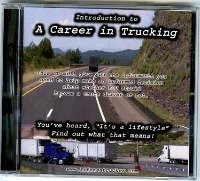 You also need to be learning about business if you want to buy trucks and start a trucking company. As well as freight brokering You also want to develop good habits like eating healthy cause you will need to focus your attention on the business not doctor visits. That would be beyond my scope of expertise but I saw a book somewhere that covered a lot of information including those aspects of trucking. I may have had a different thought in mind apart from what you were thinking when you read, "Use Trucking to Create Wealth." You may have been thinking about getting the money to create wealth from driving itself. While I see driving as giving you the perfect opportunity and tools to apply yourself to create that wealth in beyond trucking. -If you're young and single you can be saving by the ways I described above for retirement and for investing. -You can develop good habits in an environment that you basically create for yourself so there should be minimum distractions. These good habits will save you money from hospital visits and by planning ahead in other areas. - You can use technology and the internet to grow your money while you are driving. It is something that your spouse at home can work on as well. Use your passions to either self publish, create websites, make videos, create CDs or DVDs and sell them. T-Shirts, gift shops, etc. You will have to take it to the next level by investing what you make and save as a driver in either you, your ideas, your hobbies your experiences or what you love. IF you don't know enough about what you love, learn more so that you can make money doing what you love. Create online course. Could other people use the knowledge or skills that you have mastered. Is there valuable information you have that someone else, business or individual would benefit from? Is there some way you can help people to better themselves or make better decisions? If you can think through this paragraph and come out with good ideas to pursue then you may be able to build a solid foundation to create wealth. 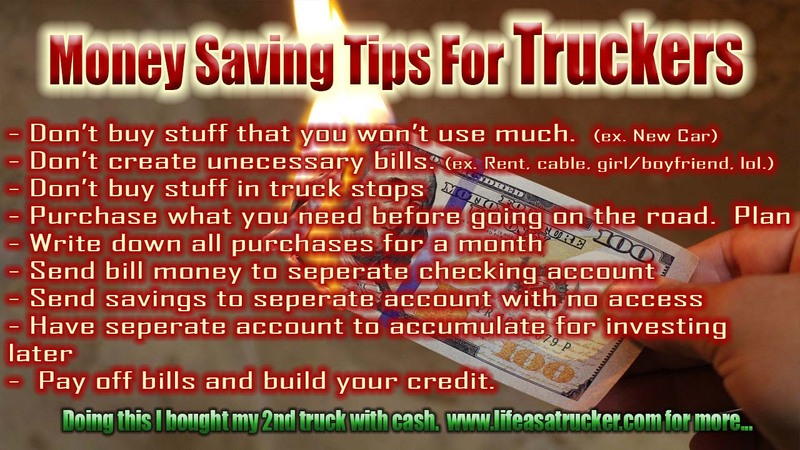 Some of the other ways to create wealth by way of using trucking as a tool if you don't have your own interest to pursue is Real Estate and or the internet. Both are recession proof. Both have the illusion that it takes some kind of wizard with born knowledge in the subject matter to profit. This is good because it keeps everyone and their mother from doing it which would over saturate the market and kill the profit! 1. Getting the information that guides and teaches you what you need to know. 2. The ability to follow what others have done, combined with how it best fits with your personal situation. Find your calling, make it your passion and rise to the challenge. Never mind the distance it seems you will have to reach. Your dreams are always within your reach. Will you reach high enough or decide it's too far to stretch. Step beyond your comfort zone. The choice is yours. Let others keep wasting time complaining about how things are while you focus on how you plan to make things the way you want them to be. For those with little time to read about the trucking jobs. Thoughts and ideas meant to awaken the mind!